Spanish Point Golf Club was founded in 1896 and overlooks the broad Atlantic. 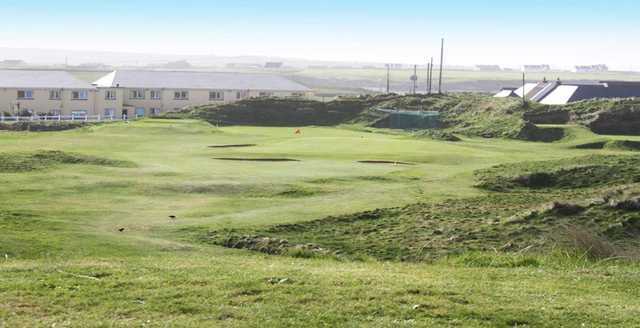 This challenging 9 hole links course measures 5330 yards with a Par of 68/70 and a SSS of 67/69 and is suitable for all standards of golfers. It is situated on the Wild Atlantic Way on the N67. Having changed and adapted over time, it is playable all year round. 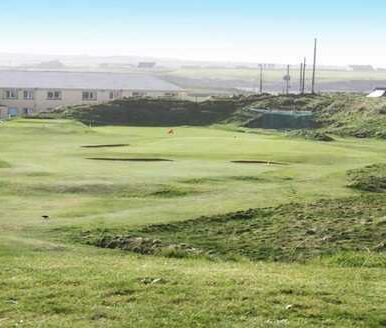 The clubhouse has spectacular, panoramic views and visitors can expect a warm welcome. Par 4, 338 yards straight. Index 5 and 6. Tee shot should be aimed approximately 10 yards right of the bunker on the left side of the fairway. This allows for the prevailing south westerly wind and makes the approach shot to the elevated undulating green much easier. Par 4 314 yards straight. Index 13 and 14. This short par 4 can catch the unwary if one decides to take it on. It is protected by heavy rough on the left and by fairway bunkers on the left and right. An accurate second shot is required to eliminate the risk of ending up in one of the three greenside bunkers. Par 5 453 yards. Index 11 and 12. This hole usually plays into the prevailing south-westerly wind. 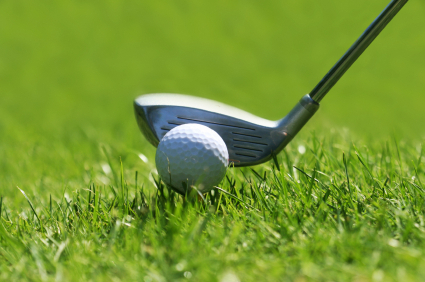 A good drive gives golfers the opportunity to make it home in 2. Golfers must be careful to avoid the 2 fairway bunkers on approach while the green is guarded by a grass valley that consists of 2 extremely deep bunkers. There is a grass bunker at the back of the green. Also a tricky ridge that runs in an east to west direction through the green makes ensures golfers must concentrate fully until the round is finished. Par 3 145 yards. Index 15 and 16. 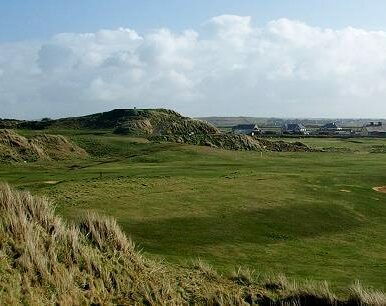 An elevated tee box on the highest sand dune on the course and a daunting task to hit a small target below. Guarded by bunkers to the left and front and out of bounds at the back, this green has a 4 foot slope from back to front. This is not the time to over-club. Par 4 450 yards. Index 1 and 2. A good drive required and favours those that are longer off the tee. The big hitters will be hitting the green with a mid iron but for the short hitters it takes 3 to get home. The left side is the way to go as there is an out of bounds on the right that goes all the way down to the green. The green is a big target, but guarded by 5 bunkers and a green that resembles a saucer. A par here is a great score! Par 4 300 yards. Index 3 and 4. A short par 4 but position is everything from the tee shot. An elevated green with a 12 foot drop off the back and sides and 2 bunkers in front. There is literally no room for error. While it’s shortness will tempt the short hitters, this is a hole that has the ability to destroy many a score card. Par 4 304 yards Index 7 and 8. A stiff dog-leg challenge. This hole requires a long accurate drive uphill. There is a bunker well placed to catch out any wayward drives. On the right are 2 mines which make a difficult pitch shot as the green is designed to collect balls in the green side bunker on the left. Par 3 117 yards. Index 17 and 18. Known as ‘The Terror’. The shot is aimed at the beautiful 2 tiered green with a bunker on the front left to catch the golfer that comes up short. Down through the years ‘The Terror’ has ruined many a good card. At the left, right and back of the green is severe trouble and should be avoided if at all possible.